Our statistical data is unparalleled in terms of detail and information provided. Seasonal conditions certainly play a part in this result. Our aim is to find breeders that work regardless of rainfall we receive. The $values will vary from year to year but the ratio relationship applies across many regions in Northern Australia. 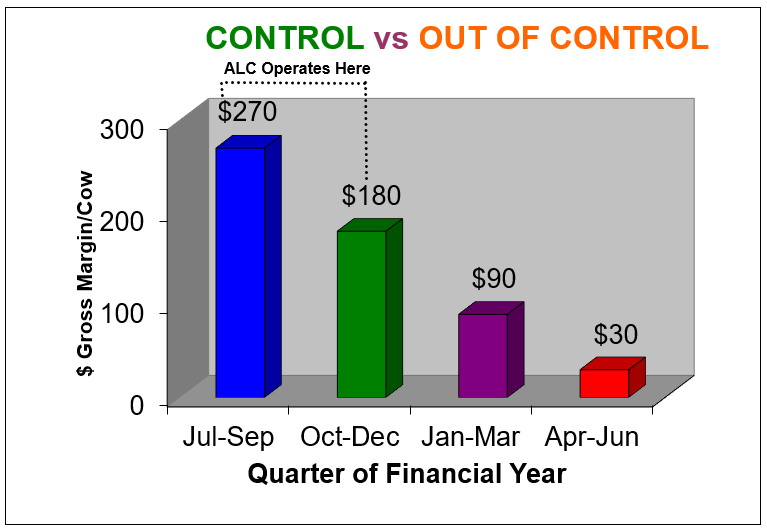 ALC operates all of its herds well inside the first two quarters of the financial year. This system has many downstream benefits. We believe that we must do everything to manage for profit and risk management. ALC constantly searches for, and analyses for, genetics that will have a positive impact on a commercial bottom-line margin. This is our responsibility. The cow herds at “Gundaroo” are divided into specific groups based on their ability to conceive early in the season, usually with no rain, regardless of the nutrition. These cows are all lactating for the duration of the mating period, starting 1st October, every year. 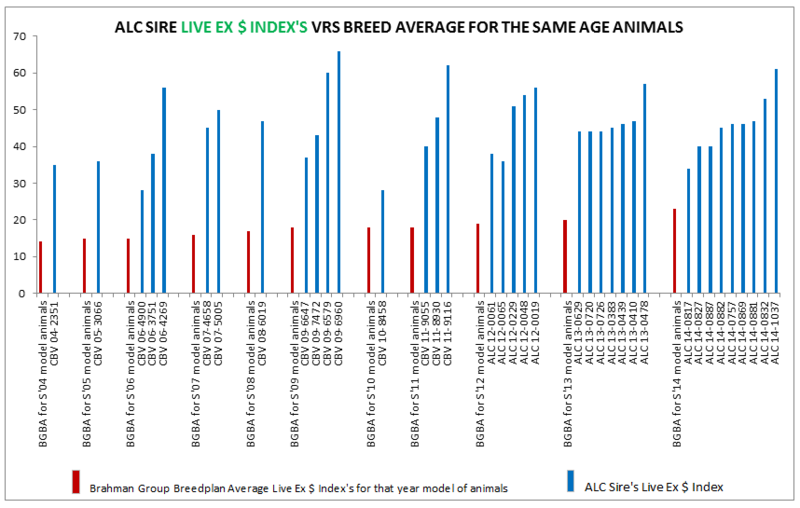 It has been an observation of ours that a percentage of our cattle have the superb trait of rapid rebreed combined with perfect uterine survival (a highly heritable genetic trait) and we aim to mate them exclusively to bulls descended from families with similar traits. We draft the herd monthly at calf tagging date into mating groups identified as C1 to C4. By using a policy of mating large groups of females with multiple sires and DNA parentage testing, we intended to highlight both sires and dams with the greatest desire and ability to mate successfully. Reproduction Speed and Adaptation are the major profit drivers in a beef herd. ALC cattle have inbuilt qualities of fast fleshing, rapid growth, and naturally gentle disposition. No drenches, no tickicides, and no fly sprays are used at ALC. Adaptation and resistance to a range of stressors is heritable and attractive to our strategies. Our cost of production is low, and kilograms per hectare are optimised. We are searching for truly adapted genetics, and are finding them. We are using the best tools that modern science can deliver and applying it with the principal of “survival of the fittest”, only to retain cattle that deliver year in year out. Cows that calve late in the season or fail to calve are penalised in Brahman Breedplan. 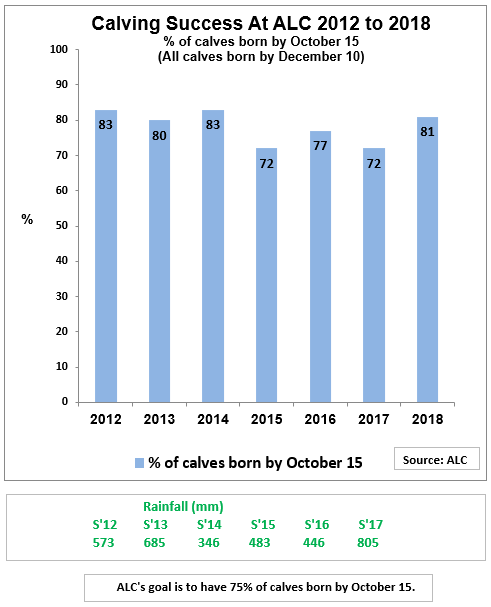 At ALC all cows retained must wean a calf every year. They must also conceive (while lactating) before 31st January every year. Even if a calf is lost by misadventure, wild dogs, or anything else, ALC cows are killed for beef. We require total accountability, and 100% returns of progeny. 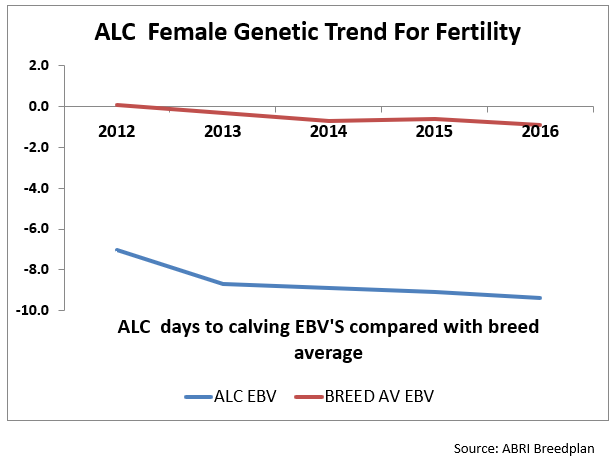 Lower, or negative Estimated Breeding Values (EBV’s) are preferred indicating shorter days to calving for the sires daughters (Source: National Beef Recording Scheme, Brahman Group Breedplan). 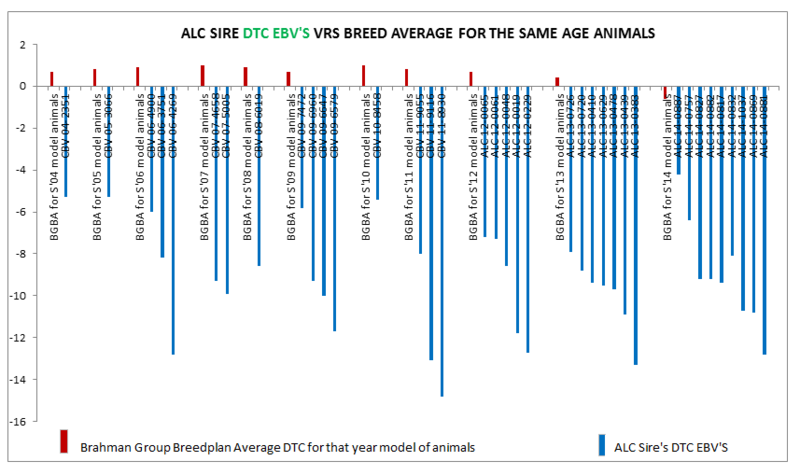 ALC has developed a strong management and selection plan for multiple years, identifying factors that contribute to accelerated reproduction and stronger DTC EBV’s. We have measured speed of re-breed, puberty threshold, calving interval, age at first calving, number of calves, speed of growth, dry season gain, wet season acceleration, as well as good temperament, and fleshiness. We measure scrotal circumference on every male calf at ALC on a monthly basis from 400 to 600 days of age. We do this to determine what animals are hitting puberty at what age. 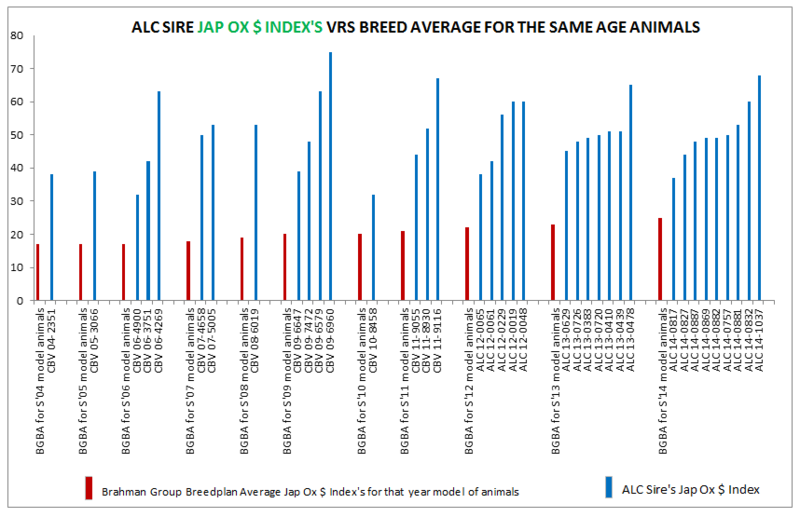 You can see ALC Scrotal EBV’s are far superior to the breed and are continuing in a positive direction. High growth comes at a cost. At ALC, our focus is on low cost of production. Moderate growth with high fertility has shown to be the right mix to achieve maximum profitability.